Tired of pasta and don't feel like making a risotto? Gnocchi (pronounced NYO-kee), small, tender dumplings made with poatoes, are an excellent alternative. When made properly, they're light and tender, with a slight chew. They're fantastic with all sorts of sauces, from a simple tomato sauce to the richest meat sauce. Florentines call them topini (little mice), which can produce a certain amount of confusion outside of Tuscany; one of my wife's aunts once caused a stir in a restaurant in Rome when she saw someone else eating gnocchi and asked for topini. The waiter said there weren’t any, and when she insisted there were, she'd seen them, he went to get the owner, who stiffly informed her that there were no mice in his restaurant. Eventually, the misunderstanding was cleared up and she had her topini. When making gnocchi, you should steam the potatoes rather than boiling them. If you do not have a steamer, put the raw potatoes in a metal colander, set the colander in a large pot, fill the pot with water to just below the colander, and set the pot, covered, to boil. The potatoes will be done in 30-45 minutes when a skewer penetrates them but they are still firm. Peel and mash the potatoes while they’re still hot (a potato ricer or food mill works very well for mashing them). Season the potatoes with a pinch of salt and slowly knead in enough flour to obtain a fairly firm, smooth, non-sticky dough -- exactly how much flour will depend upon how moist the potatoes are. Roll the dough out into ropes about as thick as your finger. Cut the ropes into 1-inch pieces, and gently score the pieces crosswise with the tines of a fork (or roll them over the surface of a gnocchi board, if you have one). Or, you can gently press them against the inside of a curved cheese grater. The choice is up to you. 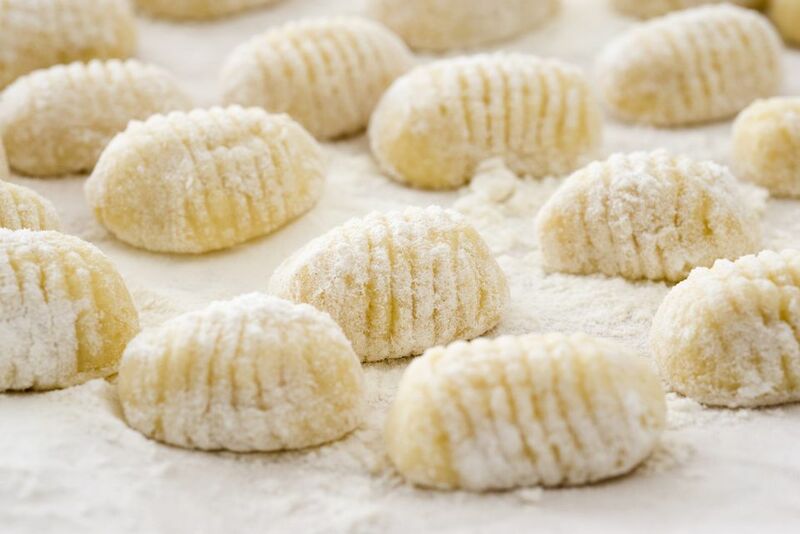 Cook the gnocchi in abundant salted boiling water, removing them with a slotted spoon 1 to 2 minutes after they rise to the surface of the water and float. Drain them well and serve them with a few leaves of fresh sage, melted unsalted butter and grated Parmigiano-Reggiano cheese, or with meat sauce, or tomato sauce, or pesto. Assemble the ingredients for basic gnocchi and steam the potatoes. Meanwhile, puree a packed 1/2 cup of spinach (fresh or thawed frozen). Work the puree into the mashed potatoes along with the flour (you'll need more flour than with basic gnocchi) and you will have green gnocchi. Serve them either with tomato sauce or with unsalted butter, fresh sage (figure a couple of leaves per diner), and grated cheese. Assemble the ingredients for basic gnocchi and steam the potatoes. Meanwhile, mince 5 sprigs of parsley and heat them with 1/3 cup tomato sauce and 1 crushed garlic clove in 2-3 tablespoons of olive oil. Simmer the mixture for about 5 minutes, then remove it from the heat and discard the garlic; work the tomato sauce into the dough, adding more flour if need be, and you will have rosy pink gnocchi. These are especially nice with unsalted butter, sage (a couple of leaves per diner) and grated cheese, in summer. Assemble the ingredients for basic gnocchi and steam the potatoes. Meanwhile, steep 1/4 cup of dried porcini mushrooms in just enough hot water to cover for 10-15 minutes. Once the mushrooms have softened, remove them from the water (strain and reserve the liquid) and mince them finely with 1 clove of garlic and 5 sprigs of parsley. Sauté the mixture for a few minutes in 2-3 tablespoons of olive oil, and when the garlic has turned translucent, stir in 1/4 cup of dry red wine and the mushroom soaking water. Continue to cook until most of the moisture has evaporated and the mixture is fairly thick, though not stiff. Remove it from the heat and work it into the gnocchi dough, adding more flour if necessary. These will be nice with unsalted butter and grated cheese as a first course, and could also work as an accompaniment to a rich stew (especially if served with another vegetable or salad). In either case, serve them sprinkled with a garnish of minced fresh parsley. Gnocchi made with dried potato flakes (instant mashed potaotes) -- perfect when you're pressed for time. Tasty Roman-style baked gnocchi, made with semolina flour and no potatoes. A variation on the traditional Roman semolina-flour baked gnocchi, this tasty version makes a great fall dish.